For the 2nd November in a row, local Lethbridge businesses have teamed up to challenge each other to some social good! 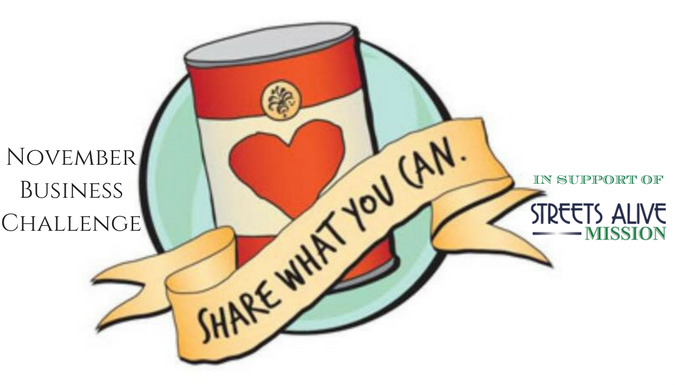 Six businesses are competing in the Streets Alive Food Drive to see who can collect the most donations for Streets Alive Mission throughout the month of November. The winners of the challenge get bragging rights. The losers have to dress like elves and volunteer at the Mission. You can stop by any of these businesses during the month of November to drop of donations for Streets Alive Mission. The November Business Challenge will wrap up on GivingTuesday, November 29th, with all of the participating businesses dropping off their donations at the Mission to kick off the giving season in Lethbridge! Then Saturday, December 3rd Streets Alive Mission will host the 2nd Annual Heralding Hope Festival! Thank you so much to Shannon for organizing this again this year. And for the fabulous support of the community!